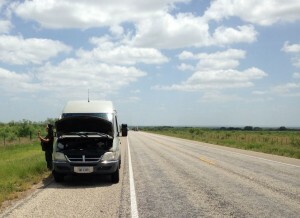 Last week we were traveling up Rt 283 just north of Brady, TX when our van just stopped. We had it towed to the nearest Sprinter mechanic in Clyde, TX who happened to be swamped. Finally after waiting seven days, he had the opportunity to carefully inspect our engine. He concluded that our engine is “dead on arrival”. Our Sprinter has been a blessing as we carry the Gospel throughout the United States, living out of it most of the year. Being nearly ten years old, rusting in spots and well over 200,000 miles, we feel it is not a wise investment to sink twelve to twenty-three thousand dollars we have been quoted to replace the engine. We have continued to trust the Lord, seeing His fingerprints on this entire event. The question now is what to do. Since we have ruled out fixing the old van, we are considering other options to continue the Gospel ministry. As musicianaries, we have very limited personal funds for such a huge expense as replacing our van. But we serve a mighty God who we trust will make every provision in due season. Please pray for us to have discernment and direction to find just the right replacement van. Pray that this vital ministry to the unchurched will continue. It is our passion to share Jesus with the American people. It is hard to believe that in this once Christian influenced nation there are communities that are indifferent, and even hardened against, the message of Jesus Christ. As musicians, we have been able to penetrate these communities and soften ears to the name of Jesus. Together with the local body, we scatter the seeds, water the tender sprouts and sometimes reap a harvest. We are thankful for a small church here in Clyde, TX for taking us under their wings. They keep saying that God had us brake down ‘here’. We are sharing with them on Wednesday night. They are contacting other area churches on our behalf. This Saturday they are hosting a bake sale in hopes of raising $1000 toward another van. Wow! We are so blessed and praise God for putting us here. Pray – God moves through the prayer of His saints. Give – No matter what we do, we need funds. We minister year round and do not have a surplus of funds to tap into should an event like van replacement arise. Donate here. Host Us At Home – Plan a home concert to introduce us to folks that may be interested in partnering in ministry. Host Us At Church – Our focus is to the secular community and it is helpful to minister in Churches that are able to take up a love offering or partner with us in regular support.